Meeting the world's growing nutrition needs is an important challenge of the future. Now, using techniques catered to plants' specific growing needs while concurrently saving space and increasingly yield, hydroponic farms might be a wave of the future. 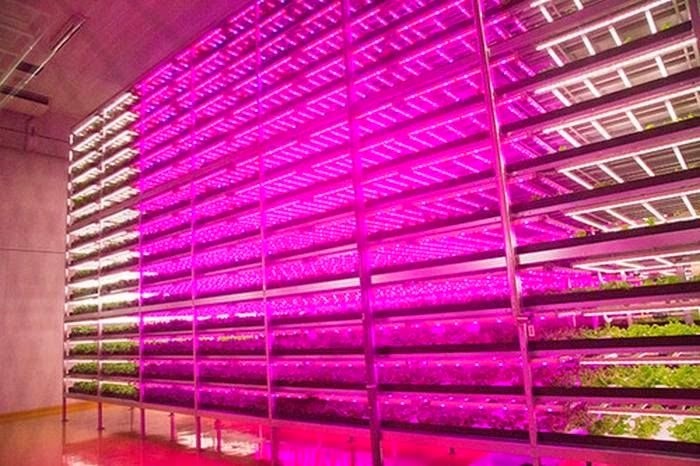 In Japan, as reported by Gizmodo, an old Sony factory has been converted into a highly efficient and productive hydroponic greenhouse. At 25,000 square feet (half the size of an American football field), this factory produces 10,000 heads of lettuce a day thanks to its innovative design and well-regulated environment. 17,500 special LED lights made by GE improve the growth time of the resident lettuce plants by 250 percent. Plant physiologist Shigeharu Shimamura explained, "We want to achieve the best combination of photosynthesis during the day and breathing at night by controlling the lighting and the environment." The 18 plant cultivation racks rise 16 levels high, improving productivity per square foot by 100 percent as compared to outdoor farms. Thanks to tightly regulated temperature and humidity controls, the farm uses only 1 percent of water compared to traditional farms. The business model is so successful, it is already attempting to expand into Hong Kong, Russia, and maybe someday to a futuristic farm near you! Salad just got much more interesting.